Her activity is divided between performing, teaching and organizing events. 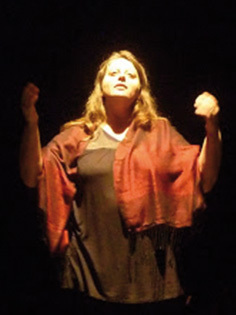 As storyteller she has participated in international events and festivals. She founded with Daniella Corradini „The Strolling Stories“, stories related to art and historical and artistic sites. With french storyteller Jean Guillon, she created an international multilingual festival touring on a bus. As a teacher, she has been working for Mus-e Rome and for the Italian Ministry of Education and Universita’ La Sapienza/Rome. Since 2013 she teaches storytelling at IED Roma. She is member of the Storytelling & Peace Council and in 2016 co-founded the Stories in Place International Association.